Home » Food and Nutrition » Biotin Can Improve Your Hair, Nails, Skin, and Health! Biotin Can Improve Your Hair, Nails, Skin, and Health! Last year, a friend of mine began to notice visible changes in her appearance—her once thick, lustrous hair began to thin out in certain areas; her nails became chipped and brittle; and she complained of dry skin. She blamed it on stress and improper eating habits—and she may have had a point. Brittle nails, thinning hair, and lackluster skin can all be indicators that your body is lacking certain nutritional value, particularly related to iron, omega-3 fatty acids, and vitamin B. In my friend’s case, I recommended she drink more water and start taking biotin supplements, which is a significant part of the B complex group of vitamins. Within six months, she saw vast improvements in her overall appearance, in particular with hair growth. 1. 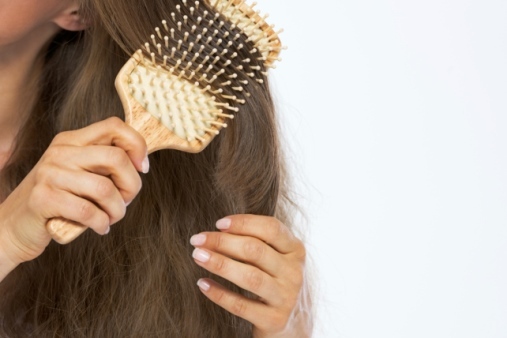 Benefits skin, hair, and nails: Biotin can help improve keratin production. Keratin is the protein that forms the nails, skin, and hair—so including the recommended levels of biotin in your diet can be beneficial to your appearance. One study illustrated a 25% increase in the thickness of nails when consuming biotin supplements. A similar study stated that there was a significant improvement in nail strength in 91% of participants who took the recommended levels of biotin for their age group. 2. Healthy pregnancy: Biotin deficiency is most common among pregnant women—the deficiency has even been known to raise the risk of abnormal fetus development. Folic acid supplements are highly recommended during pregnancy and post-pregnancy. Pregnant women who take 30 micrograms (mcg) of biotin each day, along with folic acid, will decrease their risk of biotin deficiency. 3. Beneficial for diabetes patients: Consuming adequate levels of biotin, along with chromium, has been shown to effectively decrease the blood sugar level in type-1 and type-2 diabetes patients. Consuming biotin on its own can decrease insulin resistance for those with type-2 diabetes. In a 2006 study published in the journal Diabetes Technology and Therapeutics, researchers monitored the blood sugar levels in 43 diabetes patients who consumed recommended levels of chromium with biotin. After four weeks, their blood sugar levels improved. The combination of the two supplements also lowered the participants’ cholesterol levels. 1. Carrots: You may have heard that by eating carrots, you will be able to significantly improve your eyesight. It’s true! Carrots contain high volumes of biotin, along with beta-carotene, which is the nutrient that helps with eyesight. 2. Chard: This leafy green is chalk full of biotin and makes a delicious addition to stir fry. 3. Berries and fruits: Strawberries and raspberries can provide you with high levels of biotin—you will also gain the antioxidants that are necessary for your body to function at a healthy rate. Refrain from buying them in bulk, and whenever possible, buy organic. 4. Vegetables: For maximum biotin intake, focus on consuming onions, cucumbers, and cauliflower. 5. Nuts: Nuts are not only packed with biotin, but they are also rich in protein and other nutrients. Consult your doctor before taking any new supplements or starting a new meal plan. “Vitamins and Supplements Lifestyle Guide,” WebMD web site; http://www.webmd.com/vitamins-and-supplements/lifestyle-guide-11/supplement-guide-biotin?page=1, last accessed May 15, 2015. Ware, M., “What are the health benefits of biotin?” Medical News Today web site, January 15, 2015; http://www.medicalnewstoday.com/articles/287720.php. Wong, C., “The Benefits of Biotin,” About.com, December 19, 2014; http://altmedicine.about.com/cs/herbsvitaminsa1/a/Biotin.htm. “Find a Vitamin or Supplement,” WebMD web site; http://www.webmd.com/vitamins-supplements/ingredientmono-313-biotin.aspx?activeingredientid=313&activeingredientname=biotin, last accessed May 15, 2015. “8 Foods Rich in Biotin,” FitDay web site; http://www.fitday.com/fitness-articles/nutrition/vitamins-minerals/8-foods-rich-in-biotin.html#b, last accessed May 15, 2015.